The pooches each had one of their major secrets aired for the whole world this week, and now it’s my turn: I have been a lazy dog owner. When I first brought Tess home, I lived in an apartment downtown with no yard which meant I had to take her out for walks multiple times each day. No biggie. I even lived farther away from work than I do now! But over the past few years, our morning walks have slowly been replaced with romps in the yard. Sure, physically this is probably more tiring for the pooches than a morning walk, but we are missing out on primo bonding time with our buddies. And being lazy in the mornings and sending them out into an un-cleaned yard has definitely not helped Ed’s bad habit. Of course it’s hard getting up in the morning to a few feet of snow and sub-zero temps for both the humans and dogs of this family (although Mr B & Ms M and their humans accommodate just fine. But as the mornings have been quite nice for the past few weeks (except for the downpour yesterday), we’re running out of excuses. So here is my pledge to bring back morning walks! I’m going to start realistically – I’ll cut myself a break on days where it’s snowing (it’s only April and this is Erie) or pouring. 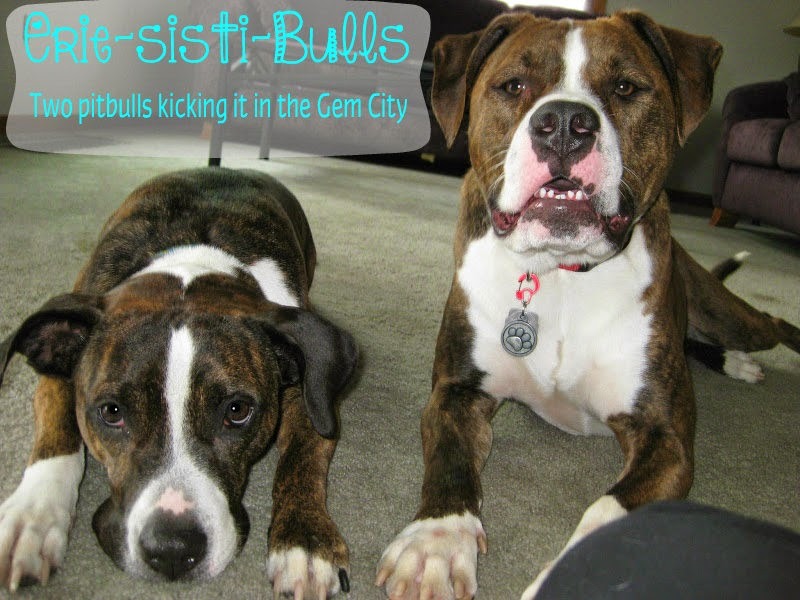 I’ll be posting our progress on our Eriesistibull facebook page each day. Then 60 days from now on Monday, June 17th, I’ll post how we did. I guess I had better get a new pair of walking shoes. Do you and your pooches have any confessions? Have you been a lazy owner lately? I had to start walking Lainey twice a day in January due to her ACL surgeries and as ugly as it was (winter in Michigan isn't any better than where you are I'm sure), we still did it every morning and every night. Although, when she was cleared by the doctor for "play time" which includes running and playing in the backyard, I became lazy and our walks quickly came to a halt. This lasted for a couple weeks and I started to notice some behavior issues with Lainey and knew how important those walks had been for the both of us. So we are back to our regularly scheduled program as of this week. I will confess that our morning walks are no where near as long as they should be, but I tend to ALWAYS be running behind in the morning and I have a 45 min commute to work, so we tend to cut the walks short in the morning and make up for it in the evening. Oh gosh! I can't imagine having to walk everyday in a Michigan winter! I'm glad you are getting back into your routine! our walks aren't long enough as we all would like, but we're starting realistically and working out way up! Yes, I figured that now it's getting nice out, it's a good time to start. I'm hoping that we stick with it through the summer and it becomes a habit we don't break once it starts getting gross out. Yep, I'll admit it, we've been lazy dog owners. We have a huge backyard that Boomer and Dottie love to explore so when the weather isn't as nice or we are in a rush they get to go outside instead of for a walk. This is nice for them but it's not the same as some time on a leash in the neighborhood or some place new. I know if we had a yard, we would easily fall into a not-walking phase, so I guess there is something to not having a yard and being forced to get out there. Though it does make sure that we have bonding time, regular training time, and a lot of exposure to lots of things. I never knew what I was doing, but I think the daily walks are part of what our pups able to do so well at crazy and crowded situations like parades and festivals. Good luck! I never walk my dogs in the morning though I have a small yard so they can go potty and sunbathe. I take them out for a long hike or play at the park in the afternoon so they are lazy in the mornings anyways. Well, I'm not sure if they are lazy because they know the routine or because it's in their nature but it works for me! That is an awesome challenge! I might try something like that as well but with evening walks; the mornings are great because the birds are singing and I love to watch the sun rise and the afternoon is fun because that is our long walk. However, by the time evening comes in Dina is back on her feet and ready to go out but I just let her in the garden instead of giving her a walk; even a short one. That is my aim too. Good luck!! It' been working for us so far...I'm hoping we keep it up! Due to being somewhat reactive (and extra determined when together) my pups walk separate. Our 1-2 walks a day still happen but have been shortened quite a bit due to time constraints. I HATE THAT! And with doing two separate walks, walking Madden doesn't always happen. That's my confession. Madden would rather swim and play frisbee so my pups get walks and she gets frisbee/and or swim time. I recently told Jay we need to get back on track with her. She loves her active play time and that's fine but we shouldn't quit walking her completely. Luckily, I've gotten walking them together down pretty well. We've been trying a few new arrangements to see if it makes it any easier, but each wants to be on their own side, so I end up fighting that. We were really bad for awhile, so I'm excited to get back on track. The pooches love playing outside together, too, so I try to make sure to give them some playtime outside when it's nice - even better if it's interactive, like using the flirt pole!